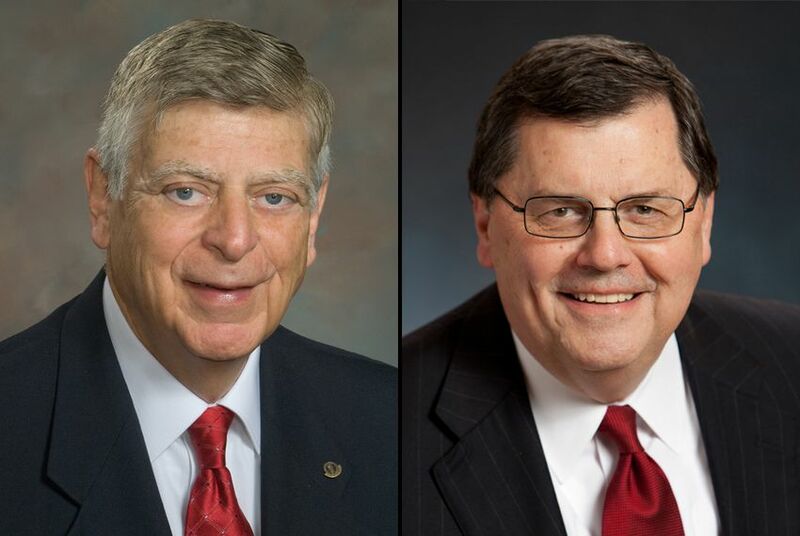 American Medical Association President Peter Carmel and Texas Medical Association President Bruce Malone on the Medicare cuts that physicians face, Texas' legal challenge to federal health reform and efforts to slash funding for Planned Parenthood. American Medical Association President Peter Carmel, a New Jersey-based pediatric neurosurgeon, and Texas Medical Association President Bruce Malone, an Austin orthopedic surgeon, sat down with The Texas Tribune to talk about the Medicare cuts that physicians face, Texas' decision to challenge federal health reform in court, and state lawmakers' efforts to curb abortions and slash funding to Planned Parenthood. An edited transcript follows. TT: For the last decade, the U.S. government has been spending more on Medicare, the federal health insurer for the elderly, than the current funding formula allows — and threatening to dramatically cut doctors’ reimbursement rates to get in check. What’s the latest? Carmel: On March 1, the physician reimbursement for Medicare goes down 27.4 percent. Everybody knows — everybody in Congress, the American public — that a reduction of that magnitude is catastrophic. Every year, year after year, [Congress] gets up to the deadline and then makes some sort of a patch. In 2010, Congress had to pass five separate laws to continue physician payments under Medicare. In 2010, for 41 days, doctors either weren’t paid or they were paid at the wrong rate. There was an enormous disruption of cash flow. Physician practices are small businesses. No small business can tolerate a disruption of cash flow. Starting Jan. 1, Congress knew this deadline was approaching. And they dithered. Finally, quite literally at the last week, the next to last day of the congressional session, they finally came up with brilliant idea. A two-month patch. Every time there’s a patch, it increases not only the cost of the patch, but it increases the cost of ever eliminating this whole thing. There is this enormous debt that scares the hell out of Congress. How can we run our businesses when we’re being asked to make an enormous investment in health information technology, in e-prescribing, in electronic medical records? How can we make any addition to our practice, any expansion of services, if we don’t know whether the first Tuesday in March we’re going to be paid at all? TT: Could doctors simply stop taking Medicare patients, like many of them have with Medicaid, the joint state-federal insurer of the poor? Carmel: What we have discovered is that doctors are very reluctant to disrupt their relationship with Medicare patients. But if those Medicare patients are going to be a loss in their practice, they’re not going to take on new Medicare patients. The vast majority of physicians in the United States already cannot participate in Medicaid. In the state of New Jersey, Medicaid pays 25 percent of [what] Medicare [pays]. It’s the lowest in the country. I’m a pediatric neurosurgeon, and when I see a [Medicaid] kid in these tiny little examining rooms, with momma, papa, the kid, three of my residents, me, a nurse practitioner, [the reimbursement] covers the cost of the nurse practitioner. Nothing for me, nothing for the office, nothing for billing, nothing for collecting, nothing for the lights. In the state of New Jersey, if a kid has an elective neurosurgical problem and they’re covered by Medicaid, I am the only doctor in a state of 12.75 million people that will see that patient. We are approaching that now in Medicare. Congress believes that doctors won’t be able to leave Medicare. But if you’re losing money on every patient encounter, you can’t make it up in volume. Medicare is the linchpin of health-system reform. If Medicare fails, the whole health-system reform falls to the ground. TT: Do you think Congress hasn’t been sympathetic to this plight because traditionally, doctors have done so well financially? Malone: I’m an orthopedist practicing in Austin. I’m not in the 1 percent. That would be a handful of specialists. When doctors start talking about money, we lose. But I can tell you right now, with this situation, I can’t keep my doors open. I don’t have to worry about what my income is going to be, because I can’t do it. Carmel: Doctors are no longer rich. We look every year at the entering medical school class to see if the doom and gloom of the future is going to affect the numbers. TT: Did Texas make the right decision when it joined the lawsuit against federal health reform and, in particular, the individual mandate requiring people to carry health insurance? Carmel: We don’t know. It has broken down into three big separate questions. The first question is, is the individual mandate constitutional? The second is, if you eliminate the mandate, does that vitiate the entire act? Almost all of the legal people I’ve ever talked to say the answer to the second is no. And third, will [the Supreme Court] let the rest of the act stand even if they determine that the mandate is not constitutional? Everybody is looking at Justice [Anthony] Kennedy. He’s the swing vote. People have gone through his past decisions with a microscope. They say he has always come down on the side of responsibility of the individual to take care of the public good, that he would support the mandate. But no one knows. Malone: There are lots of things to criticize in Texas politically, but the fact is, we’re one of 26 states [that] did join the suit. Without [an individual] mandate, without something that makes people buy policies in groups, the commercial market is in jeopardy. You can’t run the commercial market if people can call [to buy health insurance] when they get sick. The state of Texas, the TMA, does not endorse the mandate. But you’ve got to have some way to guarantee the population will have an insurance market. TT: Have you been watching the Republican political debates, and if so, what do you think of the rhetoric around “Obamacare?” It’s reviled by a lot of people. Carmel: By a group of political people. In the words of the Bible, we sit and we reverently say, "Forgive them father. They know not what they do." Malone: But you can’t tell Texans that. Because frankly, I’m sure the majority of Texans at this point politically would not support it. TT: Where do you come down on Texas’ abortion sonogram law, which requires a sonogram at least 24 hours ahead of an abortion and mandates that a doctor play the fetal heartbeat aloud and show the woman the image of the fetus? Carmel: It is a needless, dangerous interference with the practice of medicine by politicians. And as physicians, we have to oppose all interference that we possibly can by politicians in the practice of medicine. There are all sorts of rules all over the country, with state legislatures trying to dictate what doctors do. In the state of Florida, it is illegal for a doctor to ask the family of a child whether there are guns in the home. You can ask about storage of chemicals, about fire alarms, fire escapes, open windows, how the windows are sealed. You’re allowed to ask all those questions, but you cannot ask whether there are firearms in the home. Firearms are a major cause of childhood mortality and injury. It’s so extreme as to be ludicrous. The important principle is, the government shouldn’t interfere with the doctor-patient relationship. The government shouldn’t practice medicine. TT: And what about Texas lawmakers’ efforts to slash spending on family planning? Now they’re threatening not to participate in the Medicaid Women’s Health Program if they can’t exclude Planned Parenthood. Malone: That would be a really stupid thing to do. Planned Parenthood does not do abortions in the state of Texas with state funds. So this is a very stupid political thing. It’s not like the state of Texas has another safety net for these women for medical care. The Texas Medical Association doesn’t want to get into the issue of whether a patient wants an elective abortion. That’s not what we’re dealing with. We’re talking about well woman services, pap smears and breast exams, things that make public health sense. And we don’t want to see those women who are vulnerable denied essential medical services because someone wants to debate an ethics issue. That’s their right to debate that. That’s fine, but these are essential medical services. Carmel: What it sets up is two classes of patients. If you’ve got rocks, you’ve got the ability, you’ve got access to contraception, to women’s health, to all of these things. If you’re poor, we’re going to deny you access to that kind of health. That’s first of all not tolerable for medicine, and it can’t be tolerable for Americans. No American would say, "Yes, the poor should get inferior treatment." TT: Does the threat of Medicare cuts — plus budget cuts to medical residency training at the state level — compound the country’s physician shortage? Malone: We’re concerned that it doesn’t do any good to give a patient a health insurance card if there are no doctors who can afford to see them. So that’s the issue we have in Texas, and we’re going to have to work hard to try to make sure they have access to primary care. We’re afraid that the next Legislature is going to be just as bad. I think the medical schools took out all the fat trying to respond to the cuts. It may be even harder next time. Carmel: The number of doctors has grown so much more slowly than the growth of the population that the American Association of Medical Colleges has data to show that in 2020, we will be short 124,000 physicians. And that’s of a physician population of 900,000. So it’s a huge shortage. There are people in Washington who say, "Okay. If we’re going to get rid of Medicare cuts and payments to doctors, something else in the medical system has to suffer," and the two major targets are medical education and medical research. There’s no way in the world your readers would accept that if they knew what was happening.